You can easily edit, delete, or temporarily disable a password by using the Plume app. You can also edit the access level of any user with guest access. To suspend or control access on a device level, use the Device Freeze feature. Tap the ≡ icon on the app home screen. Tap on Home, Guests, or Internet Only to access that zone's Settings page. Tap the ⋯ next to the password you want to modify. Choose Edit, Disable, or Delete. Tap the key icon on the app home screen. 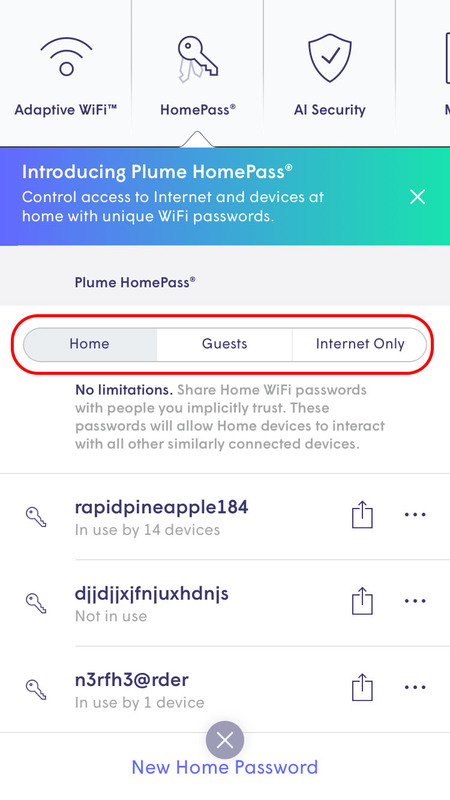 On the Wi-Fi page, under Plume HomePass tap the Home tab. Tap Home, Guests, or Internet Only to access that zone's settings page. Tap ︙ next to the password you want to modify. Choose from Edit, Copy*, Disable, or Delete. *The Copy option will copy the password to your device's clipboard.